The History of Pontiac's Rebellion including details of the cause, reason, and summary. The dates and years of the Indian wars - when the war started and when the conflict ended. Pontiac's Rebellion Summary and Definition: Pontiac's Rebellion, aka the Pontiac War (1763 - 1766), broke out in the Ohio River Valley. 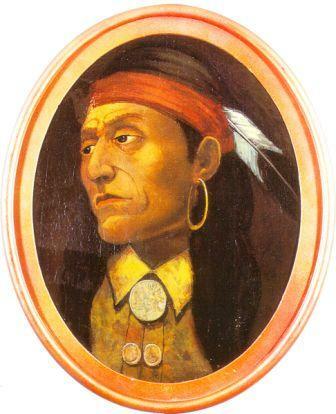 Chief Pontiac (1720-1769) was a powerful and respected head chief of the Ottawa, Chippewa and Potawatomi. Chief Pontiac led a rebellion of a number of tribes against the British and the colonists. Pontiac's Rebellion followed the defeat of the French in the French Indian War (1754-1763) and the conclusion of the series of conflicts referred to as the French and Indian Wars. Many of the Native American Indians, primarily in the Great Lakes region, had close trading relationships with France and were appalled to find that the lands were now under the control of the British. Pontiac's Rebellion was an attempt by an alliance of some Native American Indian tribes to prevent Great Britain from occupying the land previously claimed by France. Pontiac's War failed but the rebellion hastened the implementation of the Royal Proclamation of 1763 establishing a massive boundary called the Proclamation Line. The Proclamation of 1763 was designed to calm the fears of American Native Indians by halting the westward expansion by colonists whilst expanding the lucrative fur trade. The tribes of the Iroquois Confederacy were British allies and did not want to become involved with Pontiac's War. 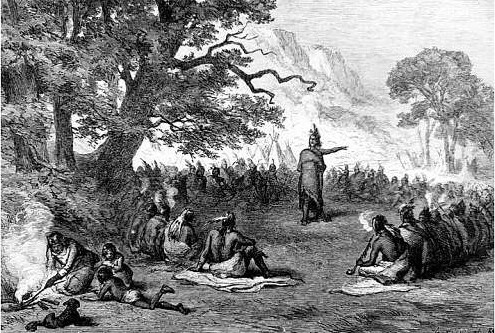 However, many of the Seneca tribe decided to join the rebellion. 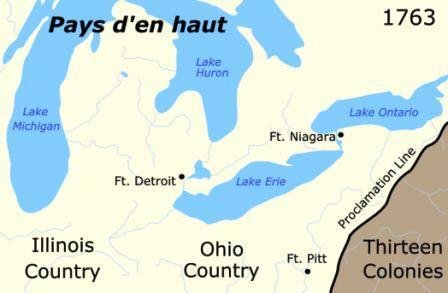 The Native Indian tribes involved in Pontiac's Rebellion lived within an area controlled by New France before their defeat in the French Indian War known as the 'Pays d'en haut' meaning the upper country. This short History Timeline of Pontiac's Rebellion provides fast facts and information about the history, years & dates, key events and famous people who fought in Pontiac's Rebellion. 1760 The final British victory at the Battle of Quebec in 1759 led to the demise of New France in 1760. 1763 The Treaty of Paris ends French and Indian War (1754-1763). Canada, east of the Mississippi River, was added to the British empire. The Royal Proclamation of 1763 officially recognized that indigenous people had certain rights to the lands they occupied, it has been called the Indians' "Bill of Rights"
The colonists were also expected to pay a tax to meet the costs of establishing and manning the borders of the Proclamation Line which led to the belief that the King had sided with the Indians despite Pontiac's Rebellion, against the interests of the settlers. This contributed to the causes of the American Revolution. Pontiac's Rebellion. Discover the key years, famous people and events of Pontiac's Rebellion together with the causes and effects of the war, conflict and battle. Pictures have been include wherever possible which show the battlefield, clothing and weapons of the Native Indian tribes and their leaders who fought in Pontiac's Rebellion. The illustrated text provides a really useful educational resource for kids and children of all ages. We have included pictures and videos to accompany the main topic of this section - Pontiac's Rebellion. The videos enable fast access to the images, paintings and pictures together with the information and the many facts featured on this subject of Pontiac's Rebellion.